841 A.R.P. 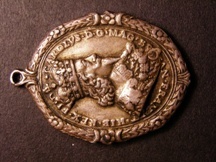 badges (11), WW.2., lapel and pin fitting, each hallmarked silver. GVF. 969 St John Ambulance Association medals, badges and related items (40), includes some silver and some enamelled pieces. VF. Together with two ST. John "First Aid to the Injured" books dated 1921. 1042 Historic Badges of The London Fire Brigade, a limited edition set c 1965, 10 white metal and enamel badges in case with booklet numbered 873. 1929 Women's Voluntary Service Medal in case of issue. 1939-45 Defence Medal (1) & War Medal (3). Together with a miniature War Medal and a Civil Defence Corps badge. GVF. 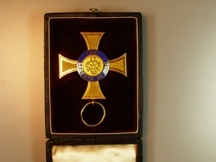 969 Order of St John, Serving Brother breast badge, silver & enamel. 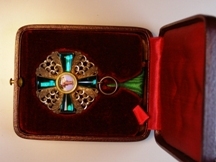 Order of St John breast badge, miniature, silver & enamel. GVF. 971 Police Long Service & Good Conduct Medal, EIIR issue (Sergt John D.Jenkins). In card box of issue. With Metropolitan Police cap badge. EF. 935 Cap Badges (5) Corps of Royal Electrical and Mechanical Engineers, 5 types from 1942-1963. GVF.